Another month, another Hidden Volume single. 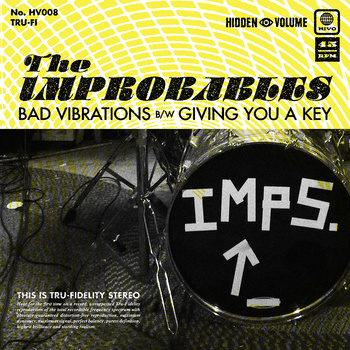 This time, it’s Philadelphia’s favorite sons, the Improbables. “Bad Vibrations” effortlessly melds surf rock guitar with the classic English beat sound (primarily due to the simple, steady, bouncy drumming). The intro is fantastic, opening with a classic-sounding riff and tambourines that tickle your eardrums. “Bad Vibrations” is just another example of Hidden Volume artists successfully re-creating the “old sound”, like singles from the Belltowers and Quitty & the Don’ts have done before them. The production’s a bit cleaner and more modern than on those singles, and may be more accessible to more modern audiences due to that, but the sound and songwriting can lead you to wonder why they never hit it big like the Who during the British Invasion. “Giving You a Key” is perhaps a more straight forward number, turning down the beat elements, and all but replacing the surf with garage rock and blues rock influence. It’s got a bit more muscle, a bit more grime, but it’s still a catchy, upbeat rocker, which seem to be the forte of the Improbables. The single is available for purchase here on Hidden Volume’s Bandcamp. The physical 7” record is pressed on blue vinyl and limited to 300 copies. The first 100 come with an additional Imps button and an Imps comb. All physical copies come with an instant download.